It's been a while since I've written about the translation business workflow solution I use and localize. Its pace of change has slowed in the past half year as the major improvements planned were all implemented, and I'm rather pleased with where it is now. 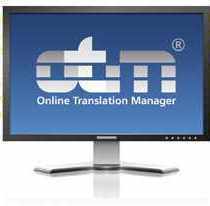 When the pilot program for the Online Translation Manager (OTM) from LSP.net began twenty months ago, the software was very specifically tailored to the workflows and working habits of a small group of companies. While the better parts of this early imprinting and a few interesting quirks remain, the working environment and communication platforms for customers and resources have been made quite adaptable to individual preferences, while still maintaining the provider's strong focus on good commercial practice, legal security of contracts and data privacy. Problems that I have had after the last round of major upgrades in 2011 (and well before that, really) have largely been when I am so distracted by the pace of my working day that I "save" time by skipping simple administrative procedures that will cost me a few precious minutes. As with nearly any system, this often means more time spent sorting things out later, not a fault of the system, which at least provides me with options for catching up on what I should have done in the first place. I have had quite a number of problems with my e-mail server in Florida this year. The reasons for the trouble are still not clear. Yet when I have used the secure OTM file areas for customers or the delivery e-mails with secure URLs, everything has worked even when my regular e-mail is hopelessly messed up. I have even found the system with its securely encrypted access for customers and subcontractors to be useful for passing sensitive information to colleagues appointed for review. Let there be no mistake about it: this is a full-featured workflow tool for running a small to mid-sized agency (or larger operation perhaps). For the low SaaS subscription rates, one cannot expect the CAT and other integration options available in some alternatives, but I need those even less than I need many of OTM's sophisticated agency features. I'm just a single translator, working alone or with an agency as an administrative backup partner, but with fairly defined, limited workflow needs. Yet I have found that this solution let's me 'punch above my weight' in many situations, especially when I offer a client a simple, safe way to receive or send highly confidential files and can guarantee subcontractors the same on those very rare occasions when I outsource and manage a project. A number of my partners and colleagues have looked at the solution. Some rather liked it, others found particular "deal breakers", like the lack of support for HTML mail that can carry viruses (the developers are adamant about the security issues on this point). I've also had specific little "nice to haves" in mind that I still have not. But what I do have is an infrastructure that is far more powerful and robust than anything else I could afford and which takes very little of my time while giving a lot of time back. Not bad, really.